Ever been panicked about the future, filled with anxiety and dread? Today I’m at Panic World Headquarters, reading words of peace. As our group hikes today in Caesarea Philippi, I enjoy its raw natural beauty, its forests and waterfalls. And I think about how, toward the end of his earthly ministry, Jesus journeyed here, to the extreme northern reaches of his country, as far away from Jerusalem as he could get without heading across the border. In Jesus’ era this was a resort town with a spa and impressive Greco-Roman temples. Pagan shrines were carved into an enormous cliff face with a yawning cavern from which a spring-fed waterfall gushed. Earthquakes have since diverted the water flow from the cave mouth to fissures at the bottom of the cliff, but the spring here is still one of the primary sources of the Jordan River. In a land often in desperate need of precipitation, the water pouring out of the dark cave must have seemed to ancient people like a supernatural source of fertility. Maybe that’s why, from prehistoric times, this was a place of pagan worship. By the time of Christ, the cavern here was venerated as one home of the god Pan. I wonder if Jesus’ disciples thought Pan looked like the devil, with his goat-like horns, and his tongue always stuck out in a suggestive leer like some eighties heavy metal star. Pan was the god of panic. In fact, we get our word “panic” from his name. Romans prayed at this temple for their enemies to be filled with dread and confusion. In 70 AD, the Roman general Vespasian rested his troops here for twenty days before they went on to destroy Jerusalem and tear down Herod’s temple. Every day, he sought the blessing of Pan on his soldiers, that they might foment panic in their enemies. But why are Jesus and his disciples way up here in this pagan area, about as distant from Jerusalem as possible? I think it’s an escape from the pressure they’re feeling further south. It’s now been three years since Jesus started his ministry, and the Jerusalem religious leaders are becoming more and more extreme in their opposition to Christ. 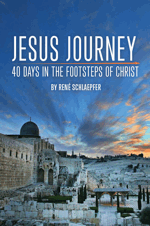 Any trip toward Jerusalem by Jesus would ignite the political powder-keg there. And he knows it’s not quite time for that yet. Many of Christ’s early followers have become impatient and disillusioned. If he’s the Messiah, they ask, why doesn’t he make it clear? And now his closest disciples are starting to feel anxious too. They’re probably wondering why, if Jesus is the Messiah, they’re on the run, he’s speaking in riddles, and they have so much opposition from fellow Jews. I imagine they looked around at all these intimidating big beautiful rock-carved temples. Then they think of Jerusalem with its beautiful temple. And for all their sacrifices, they have nothing to show. They have no beautiful buildings. Fewer followers. They don’t even really have momentum anymore. Nothing seems to be going right. Stop right there. Do you see how he’s talking about building on rock — right here in the very place where there’s a temple built out of a huge rock? Jesus is saying: From you, a little pebble, I will build my massive community, a kingdom stronger than any of these stone temples. And not just Peter. Anyone who answers Jesus’ question the same way is one of the “living stones,” as Peter himself later points out (see 1 Peter 2:5). Remember how Jesus was probably raised to be a tekton, working in stone, as Joseph was before him? Well, he is the master stonemason still, shaping Simon Peter and you and me into the church he is building. Note: He builds it. Not us. We’re the stones. But he’s got the plan. He’s in control. Now remember again where they are standing. Roman power is in full flower. Looks like Pan and his disciples are here to stay. In fact, Pan’s worshippers will literally destroy the glorious Jerusalem Temple in a few short years. And, in fact, this place crumbled into ruin after about 600 AD, while Christ’s movement has grown for centuries and centuries. Jesus’ assurance to the disciples goes for you, too. You may feel dread, panic, a feeling that life is purposeless. Like you’re just a little pebble. Unimportant. Surrounded by the trappings of true power. The ways of the world may seem to you to be looming large, far greater than the mild efforts of Christ-followers. I went through a time in my life when I felt exactly that way too. Filled with a continual sense that something horrible was always just around the corner, I couldn’t sleep, couldn’t focus, had no appetite — and ended up in the hospital with anxiety attacks. I wondered if all my meager efforts for God were meaningless. I am so thankful for a godly doctor who helped me through that time. And who led me to the words of Christ in this very passage, words which became my anchor. There will be times you will feel like the disciples. Don’t panic. The Prince of Peace is right here. He has a greater plan than the Prince of Panic. And he uses little pebbles like you and me for his purpose, building a kingdom that will last forever. If the disciples were discouraged and doubt-filled, in need of a vision readjustment, they were about to get one beyond their wildest dreams. How have you been feeling like a pebble lately? How are you encouraged by today’s devotional?